Atmospheric number concentrations of INP are very low ( ~1 m-3 to ~100 L-1). To measure these, at TROPOS we set up two different off-line techniques which will be introduced below. Both can be used to examine suspensions from materials as e.g., mineral dusts, but also samples from filters collected in ambient air (where the latter can be viewed as a way to mass INP for easier detection). Depending on the filter material, the collected particles can be washed off the filters, and this washing water can be used for experiments directly. Alternatively, filter punches with 1mm in diameter can be used which are then immersed in pure water (this can only be done with INDA, see below). The main part of LINA is a silver plate with dimensions of 4cm x 4cm which is cooled by a Peltier element. A clean hydrophobic glass plate (4cm in diameter) is put onto this plate at the beginning of each experiment. 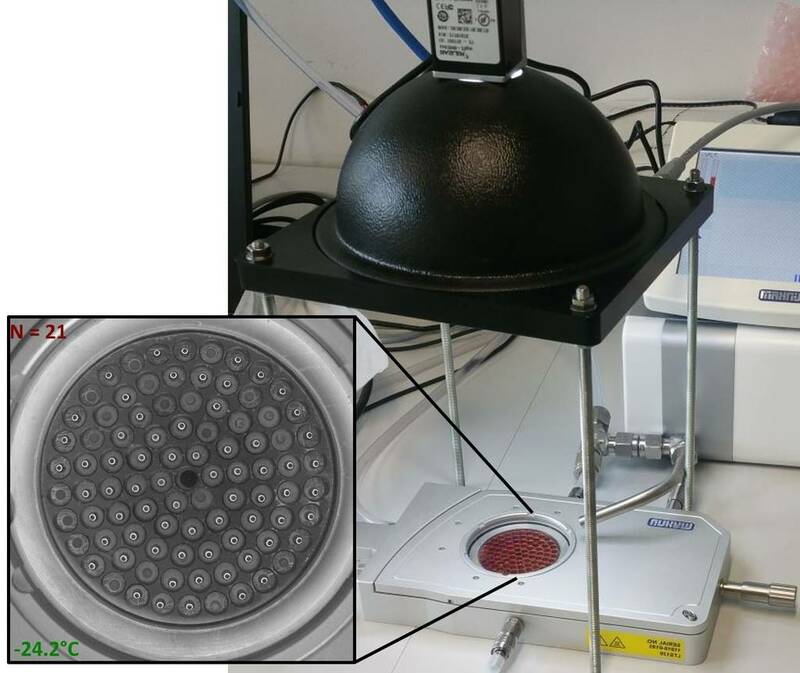 A similarly sized aluminum disk (with 90 holes, each with a diameter of 2mm) is fixed on top of the glass plate, and a droplet with a volume of 1μL from the suspensions that shall be examined is pipetted into each of the holes. The aluminum disk is then covered with a second glass plate. All of this is contained in a housing, and the droplets can be viewed from top through a window. To prevent fogging of the window the housing is constantly flushed with dry air during an experiment. A camera and a circular illumination system are installed above the window. During an experiment, droplets typically are cooled at a rate of 1K/min. Every 6s, the camera takes a picture, resulting in a temperature resolution of 0.1K. Once frozen, a droplet will not reflect the light from the illumination system as before, hence a differentiation between frozen and unfrozen droplets can easily be done automatically. This results in information on the number of frozen droplets at each temperature. The picture shown here (insert on the left in the picture above) shows 21 frozen droplets which, for that particular experiment, were reached at -24°C. Further information on the usage of the obtained data as well as on background measurements and calibrations can be found in the literature (e.g. Chen et al., 2018; Knackstedt et al, 2018). This set up was partially copied from the one described in Budke & Koop (2015). 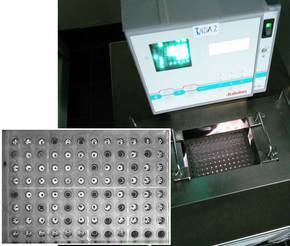 For INDA, we use 96-well PCR-trays, where each well is filled with 50μL of the suspensions that shall be examined. If, however, quartz fiber filters were used for sampling, each well is filled with 50μL of pure water in which then a punched filter piece (diameter of 1mm) is immersed. The PCR is then sealed and installed in a bath thermostat in such a way that the level of the liquid in the PCR-tray is below that of the thermostat. In the bath of the thermostat, there is a light source underneath the PCR-tray. The thermostat is then cooled by ~ 1K/min. A camera installed above the PCR tray takes a picture every 0.1K. Similarly to LINA, frozen and unfrozen droplets can easily be distinguished visually (see insert to the left with 25 frozen vials - the small dark spots in the unfrozen vials are filter punches). Again, further information on the usage of the obtained data as well as on background measurements and calibrations can be found in the literature (e.g. Chen et al., 2018; Knackstedt et al, 2018). This set up was partially copied from the one described in Conen et al. (2012), while the usage of PCR-trays was suggested in Hill et al. (2014).